Well, if you looked at any of my posts this week you will know that I am back from quite a long break… a lot longer than what I anticipated. So I thought I would share a few things that went on while I was out of sight. First thing and I would say the biggest thing is that our youngest child has moved out. Yep, Mike and I are now officially empty nesters. I am still getting used to the whole concept of just the two of us in the house (and when Mike is traveling it is just me). Talk about quiet! But it is good to see your children grow up and move out to make their own way in life. Another thing, I had my 40th class reunion from high school. Boy does time fly or what?!? It was fun to see people that I haven’t seen for years. It’s amazing how some people have changed so much and then others I recognized them in a second. I had a small class – under a 100 people, so everyone knew everyone in our class. It was a fun night talking about old times and seeing who had grandchildren. 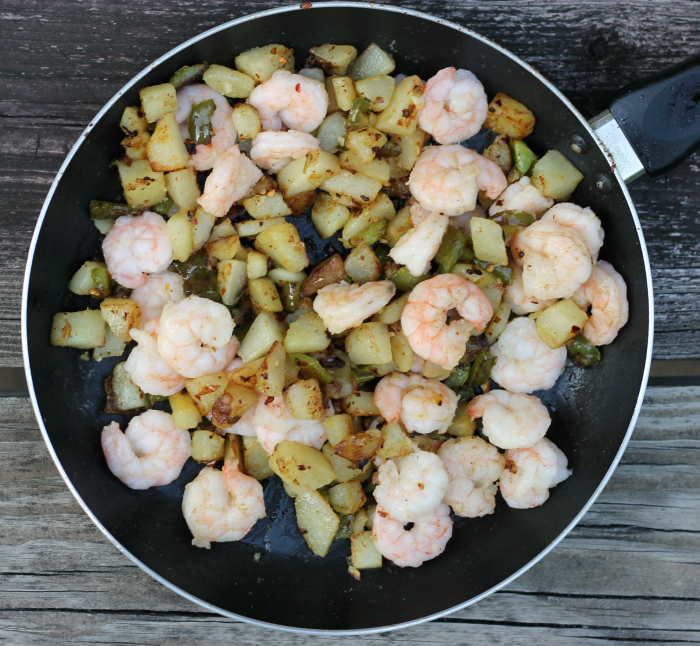 As I stated early I love this shrimp potato skillet. 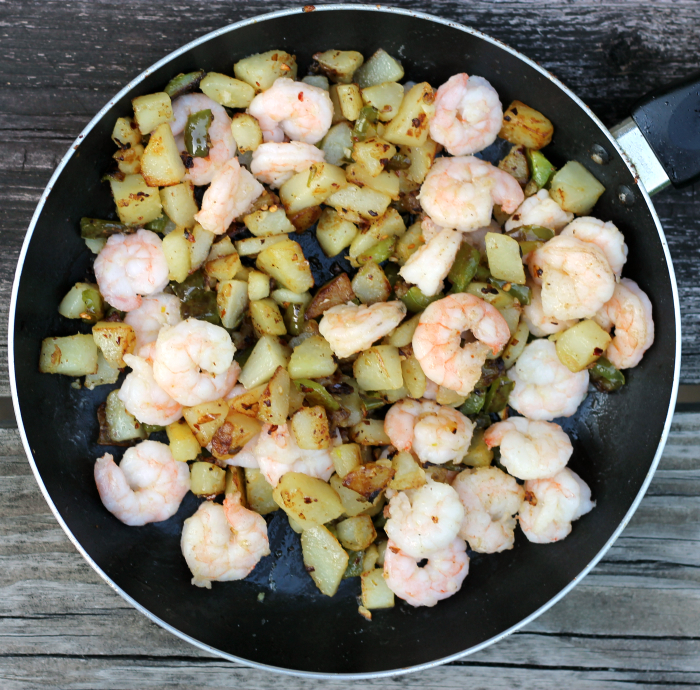 Not only for the flavor, everything is done in one skillet. Nice, fewer dishes to clean up after eating. That is always a plus during a busy work night. You start out by frying potatoes, onions, and peppers. 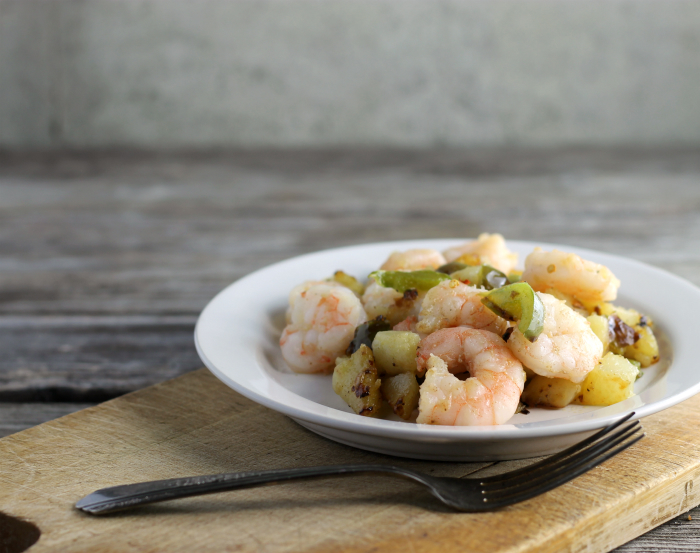 The onions, peppers, and potatoes should be fried until they are tender and potatoes are lightly browned. Once this is completed you will want to remove everything from the skillet and add the shrimp and once they are cooked until pink add the vegetables back into the skillet and heat back up. Season with salt, pepper, and red pepper flakes and your meal is complete. 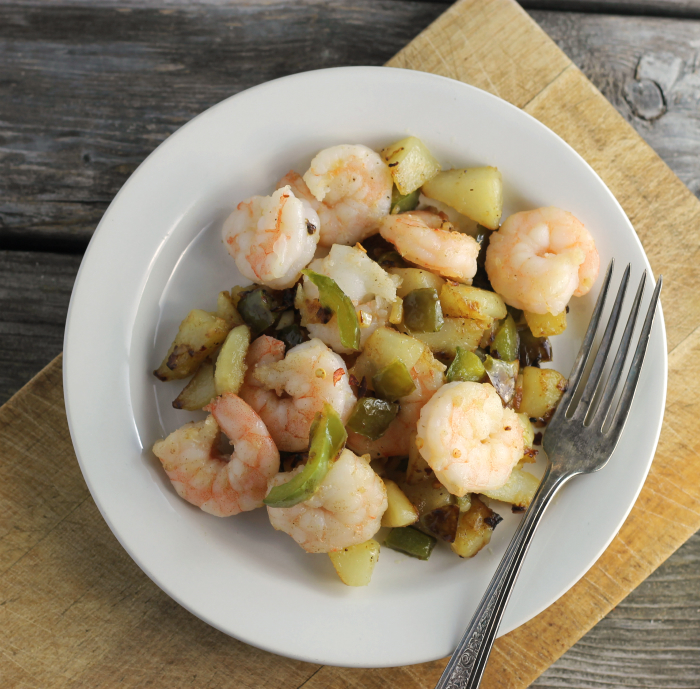 Oh, I guess you can add a side salad or a little fruit, but the shrimp potato skillet can be a meal in itself. Simple, easy, and takes little time to complete this meal. Delicious. Add about 2 tablespoons of olive oil to a skillet and heat over medium heat. Add the potatoes, peppers and onions. Cook for about 5 minutes until the are tender and potatoes are slightly brown. Add the garlic and cook until tender. Remove the vegetables from the pan. Add the other tablespoon of olive oil or more if needed. Add the shrimp and cook until they turn pink. Time will vary on the size of the shrimp. Add the vegetables back into the skillet. Stir until all is mix well and vegetables are heated back up. Season with salt and pepper to taste. Sprinkle the red pepper flakes over the mixture and stir in. Love the cutting board. Well done, again. Those shrimps are so succulent and delicious. Have a great weekend, Dawn! 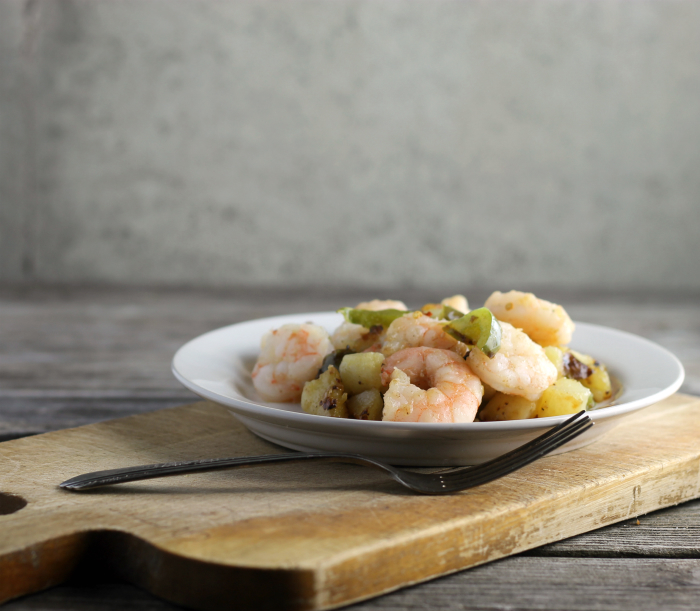 I love shrimp and this shrimp potato combo sounds interesting and looks delicious. Thank you for sharing this. What a wonderful looking meal! I love shrimp. Nice post. I love shrimp !! Look delicious ! 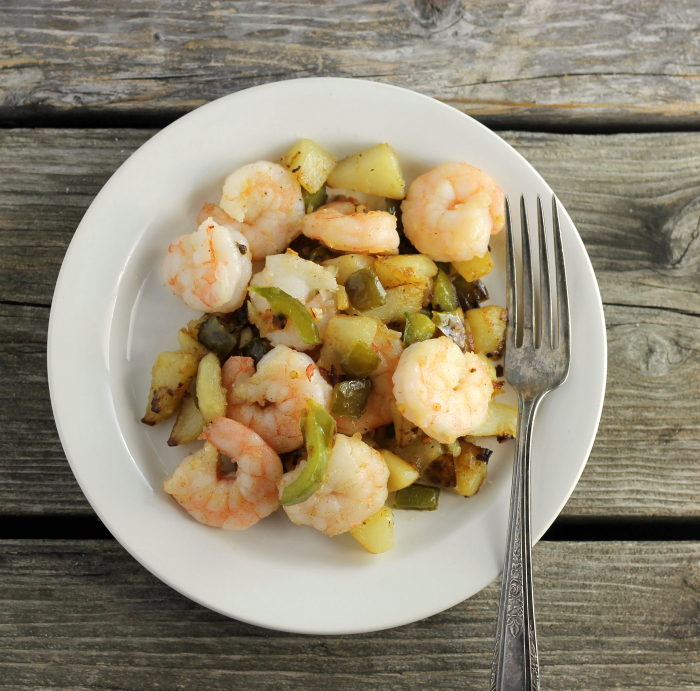 I love how you turned a classic fried meal into a delicious (and healthy!) skillet version. (Not to mention the bonus for easy clean-up here!) Enjoy the peace and quiet around your house. Laura and I were just commenting that we used to have peace and quiet…and now we have a Robbie. Haha! Thanks for a great recipe, Dawn! !